The last winery we visited on #WineStudio’s August journey through the Liquid Voices of Hudson Valley was Millbrook Vineyards and Winery. Millbrook Winery has been called the “Hudson Valley flagship winery” by the New York Times as well as “a great place to visit” by The Wall Street Journal. The hour long #WineStudio class tasting and learning about Millbrook Vineyards was both lively and educational. Augusts’ #WineStudio Liquid Voices of Hudson Valley was sponsored by Hudson Valley Tourism and made possible in part by Debbie Gioquindo, the Hudson Valley Wine Goddess. 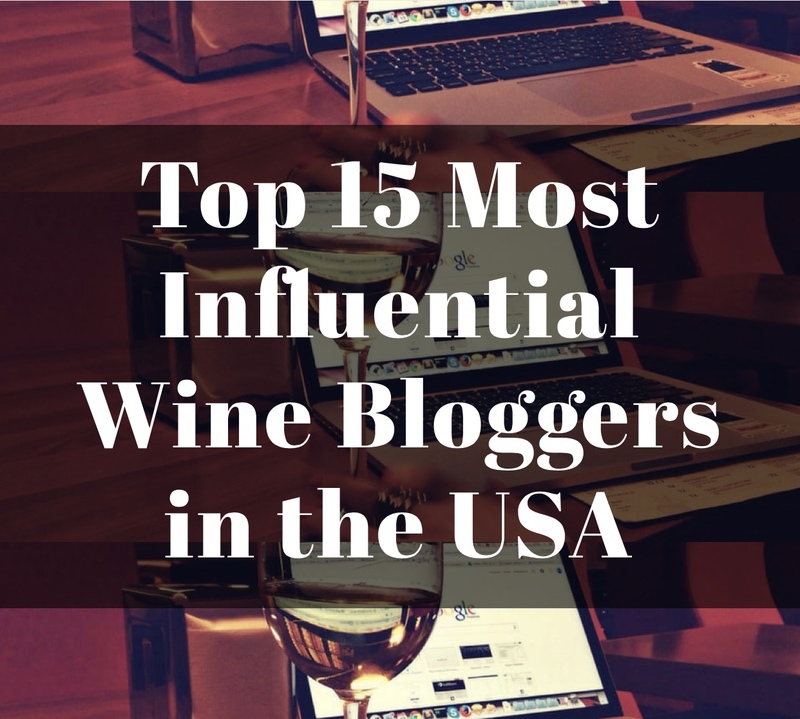 As regular followers of my blog you know by now what #WineStudio is all about. For new followers, welcome and thank you, #Winestudio is hosted each month by Protocol Wine Studio. Protocol describes #WineStudio as “an online twitter-based educational program where we engage our brains and palates! 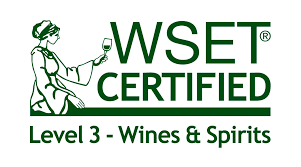 It’s part instruction and wine tasting, with discussions on producers, grapes, tourism, terroir, regional culture, food and wine matching and what all this means to us as wine drinkers.” So please join the class on Tuesday evenings, 8pm CST, by following #Winestudio on Twitter! 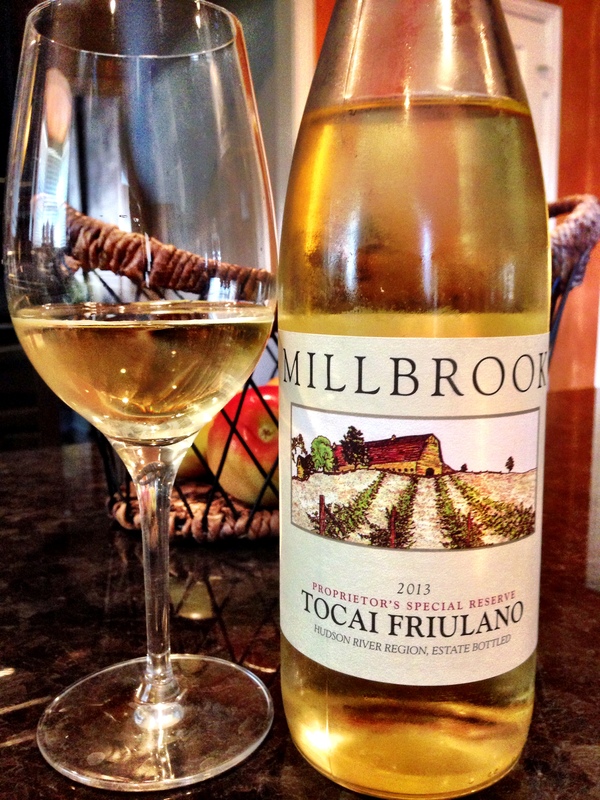 Millbrook Vineyards and Winery Proprietors Special Reserve Estate Bottled 2013 Tocai Friulano: This bright golden wine met the nose with refreshing citrus, ripe melon and fresh cut herbs. It delighted the palate with crisp, clean flavors of Meyer lemons, limes, Korean melon and pears. The Tocai Friulano offered a tease of effervescence as it pleased with its medium body wine with medium finish. This wine was well balanced with pleasing acidity and 13% alcohol. SRP $20. 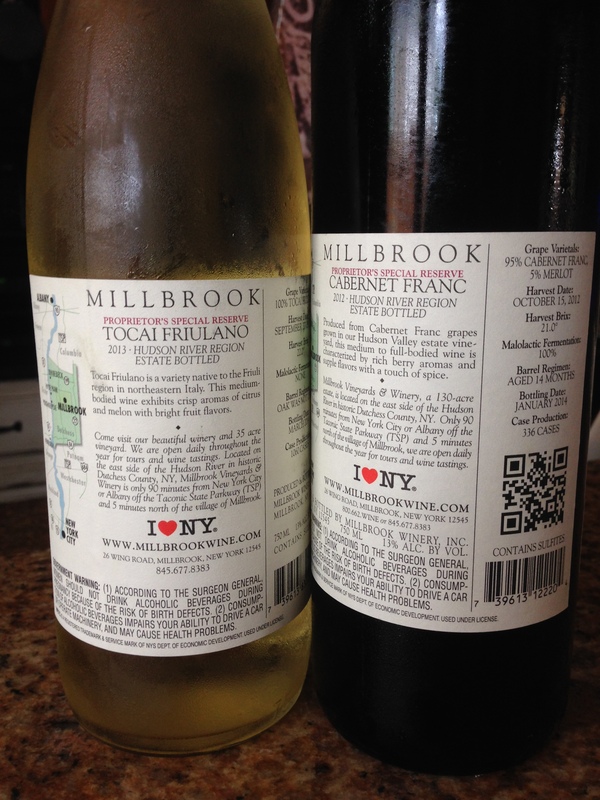 Millbrook is the only Hudson Valley wine producer of Tocai Friulano. It was a delicious wine, well received by all on #WineStudio, I recommend this wine. Millbrook Vineyards and Winery Proprietors Special Reserve Estate Bottled 2012 Cabernet Franc: This deep ruby wine was crafted of 95% Cabernet Franc and 5% Merlot. It opened with aromas of bramble berry compost, peppery spice, smoke and a hint of espresso. On the palate this wine offered ripe cherries, blackberries, and white pepper with a classically Cab Franc touch of green peppers along with smoke and a hint of mocha on the back of the palate. 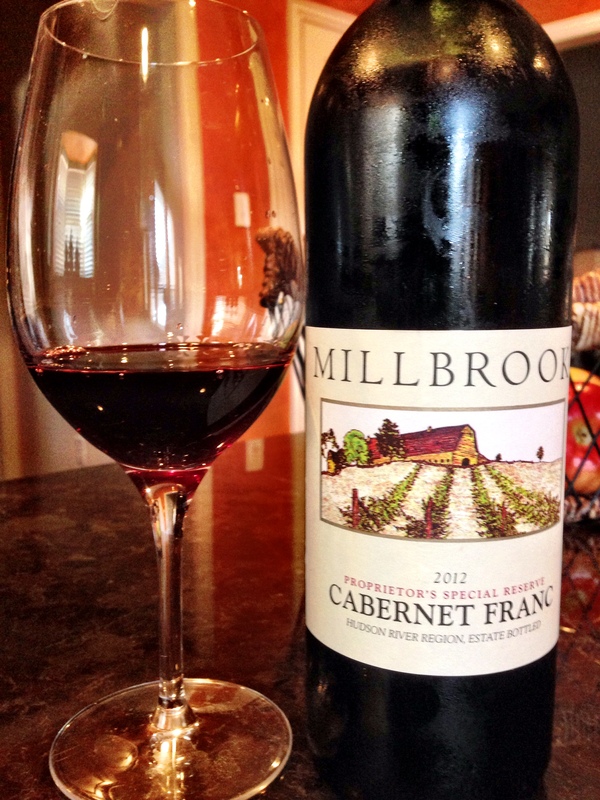 The Millbrook Cab Franc was a medium body wine with balanced tannins and round acidity, finishing dry on the palate. It underwent 100% malolactic fermentation and spent 14 months in oak barrels. It was a very food friendly wine that was quite enjoyable. SRP $30. I recommend this wine. As I said both these wines were food friendly. 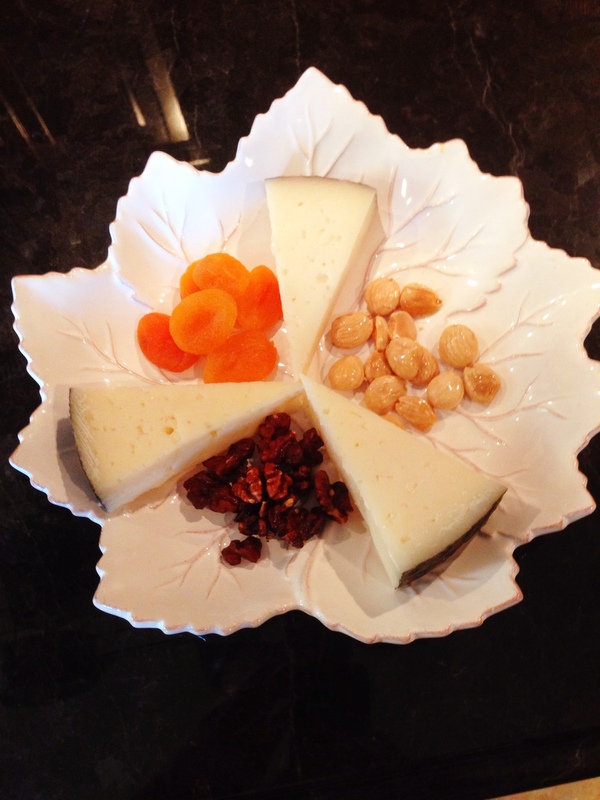 I began by pairing each with an assortment of cheeses: Iberico, Drunken Goat and Manchego; as well as Marcona almonds, carmelized walnuts and dried apricots. Both wines paired well with those appetizers. For the entre I took my inspiration from a recent article I read by the Armchair Sommelier where she wrote of a salad she recently made from a recipe she found on Pinterest. Click here to read the Armchair Sommelier’s article and click here for the original recipe from Just a Taste. 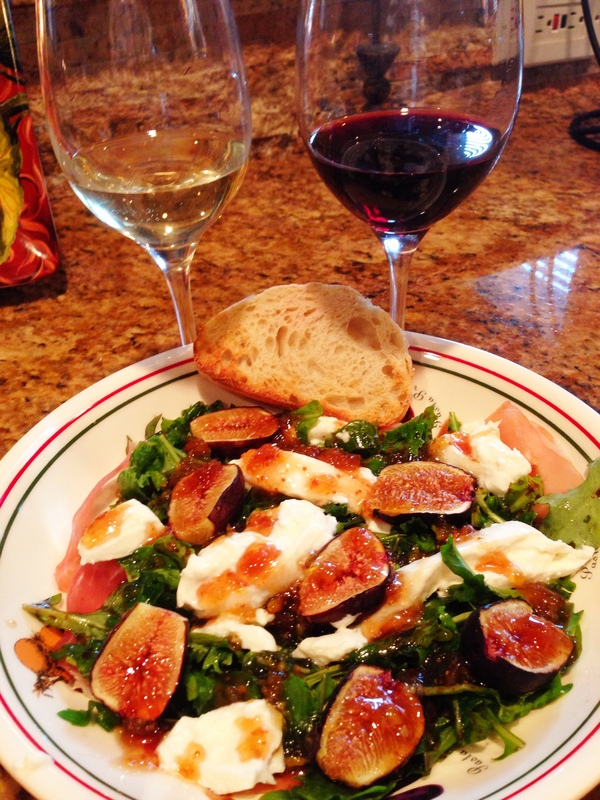 The salad was made of prosciutto, burratta, arugula, figs (I used roasted black mission figs), olive oil, balsamic vinegar and fig compote (I used fig preserves). She chose to pair the salad with champagne and asked her readers what they would pair with the salad. I thought the salad would pair great with the H Stagnari Cabernet Sauvignon from Uruguay I recently wrote about because when I think figs and balsamic vinegar I think red. I felt like this #WineStudio with both a red and a white from Millbrook would be the perfect time to test out this salad. BOTH wines paired excellently with the salad. My personal preference was the red because it’s my style; however, it was a win-win! I’d like to draw your attention to the labels on the back of these bottles. The labels offer more information than most wines which is very helpful to consumers and writers. I noticed the labels as soon as I took the wines out of the box. Millbrook is really on to something with these labels. It would be great if more wineries followed suit. Millbrook Vineyards and Winery is part of the Pebble Ridge Vineyards and Wine Estates family. John and Kathy Dyson are the proprietors of Pebble Ridge. In addition to Millbrook they own wineries in the North Central Coast of California, Russian River Valley of California and Tuscany, Italy. John grew up in Millbrook, New York. 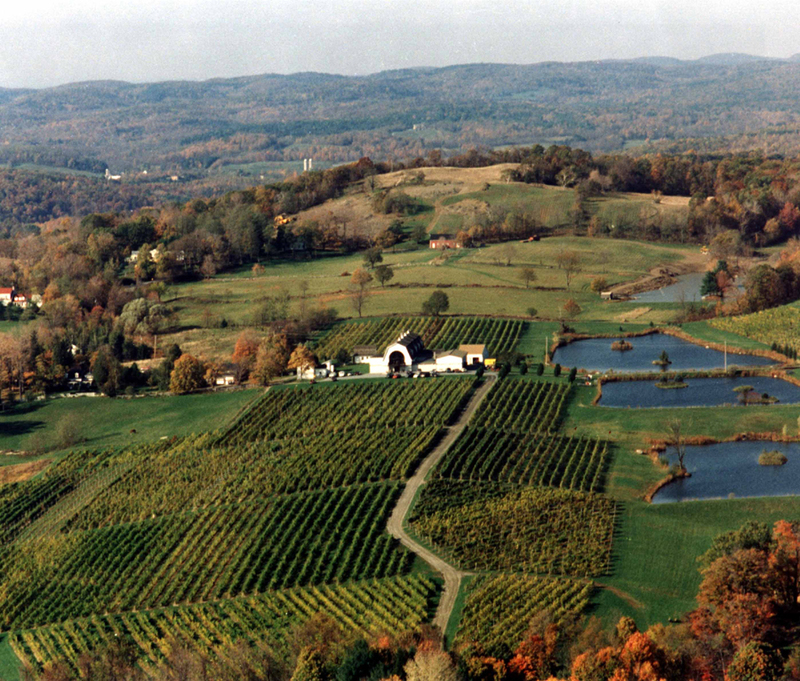 After attending college at Cornell University and meeting his wife Kathy in Washington DC, holding the office of Commissioner of Agriculture in New York (1975), and Commissioner of Commerce in New York (1975-79), John and Kathy decided to convert an old dairy farm in Millbrook into Millbrook Vineyards and Winery in 1979. Furthermore, as you can see from the back label of Millbrook wines, John Dyson developed the “I Love NY” marketing campaign when he was Commissioner of Commerce; this campaign has proven to be one of the most successful branding campaigns anywhere. 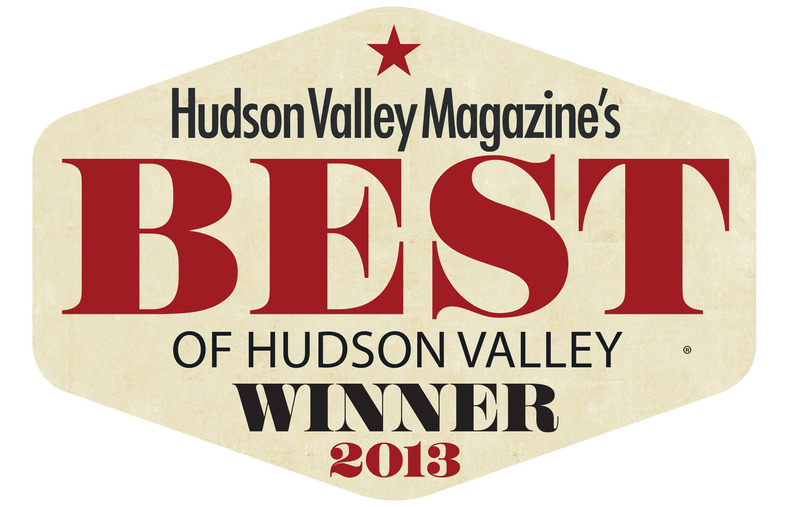 Millbrook has won the Hudson Valley Magazine’s BEST of Hudson Valley award 18 consecutive years. Millbrook is just a 90 minute drive from New Your City and open seven days a week offering a variety of tastings and tours. 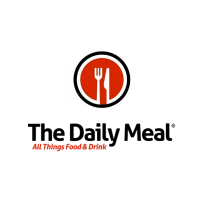 Additionally, Millbrook hosts exciting events and educational classes at the winery throughout the year as well as their Vineyard Grill and Café. To learn more about Millbrook Vineyards and Winery, see their calendar of events and view their entire portfolio of wines and order some wine for yourself I encourage you to visit their web site. My Song Selection: The song I have chosen to pair with Millbrook Vineyards and Winery’s Proprietors Special Reserve Estate Bottled 2013 Tocai Friulano and Proprietors Special Reserve Estate Bottled 2012 Cabernet Franc is Waiting on a Friend by the Rolling Stones. As I am writing this article it’s been 3 days since I left my daughter in Ohio for college. Although it is a normal part of life, I am grieving a bit and am experiencing a temporary MoJo set back. At the end of #WineStudio I asked several of the regular participants if they had a song recommendation for tonights’s delicious wines. William Pollard, who is a music lover as well, gave an immediate response suggesting this song. It was a great suggestion and I am so thankful to him! 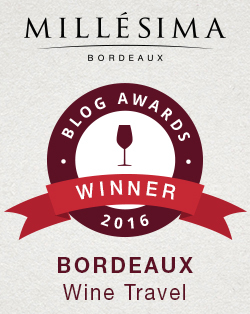 Please check out William’s web site and his monthly wine podcast. It was such a pleasure to participate in #WineStudio’s Liquid Voices of Hudson Valley and make new winery friends! A special thank you to Millbrook for sharing two unique wines from their winery with us and to Stacey who took time out of her vacation to share all about Millbrook with the participants of #WineStudio. 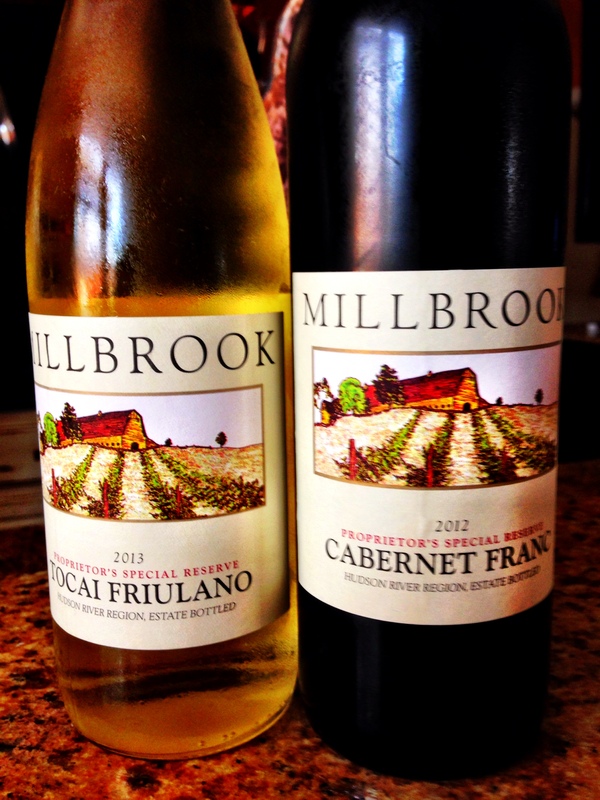 Get your own bottles of Millbrook Vineyards and Winery’s Proprietors Special Reserve Estate Bottled 2013 Tocai Friulano and Proprietors Special Reserve Estate Bottled 2012 Cabernet Franc and let me know what song you would pair with them. Cheers! Sounds great! I’m determined to follow along on Twitter with the next #WineStudio night now. YAY! It begins next Tuesday, 8 pm CST! See you there! I love the Hudson Valley, it’s so beautiful and I now must try Millbrook Wines. The food pairings sound perfect. Very good wines being produced in Hudson Valley! Millbrook is highly recommended. Cheers!